On Sunday 21st of September, AAfG in cooperation with Defend the Right to Protest will be holding a fundraising music event in tribute to Pavlos Fyssas, one year after his murder. Rapper Pavlos Fyssas who had a strong anti-fascist and anti-racist sentiment in his lyrics, was murdered by members of neo-Nazi organisation ‘Golden Dawn’ on the 18th September 2013. Join us in giving a powerful message against the rise of fascism and racism in Europe. From our neighbourhoods, to the whole of Europe there is only one message to those who thrive on fear: NO PASARAN! Proceeds will go to the surviving refugees of the Farmakonisi tragedy fund, ‘Solidarity at the west of Athens’ campaign in Greece, and ‘Defend the Right to Protest’ campaign in the UK. This entry was posted in Events & Actions and tagged AAfG, event, killah p, pavlos fyssas by Anti-Fascist Action for Greece. Bookmark the permalink. 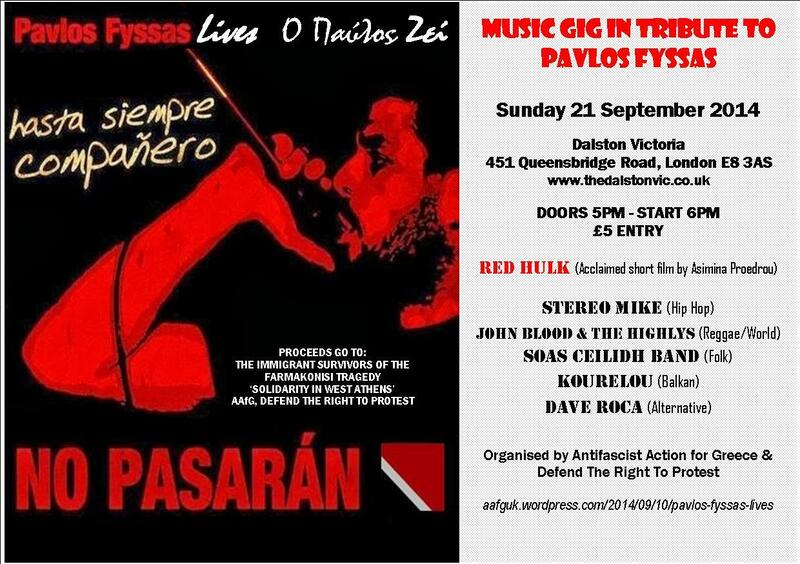 Upcoming solidarity fundraising event in memory of Pavlos Fyssas, one year on.